It’s hard to believe that June is here! The weather is finally starting to warm up (the cold weather was dragging on forever here) and we’re venturing outside. This is the first summer that my daughter could really ”do anything”. She was born in June so last year, being only one, was just learning how to walk and explore. This year, a full-fledged active two year old, requires strategic planning to keep her entertained. The good thing is that she’s only two so doesn’t really know how or what is out there unless we expose her to it. The bad thing is that she is very busy and requires me to be as creative as I can be to keep her entertained all summer. Painting with water. We did this the other day and it’s as easy as it seems. Bucket of plain water and a paintbrush! We painted the driveway and fence. This literally entertained her for over an hour and 100% mess-free! Chalk/bubbles. Another favorite and cost less than $1. Explore your neighbourhood. I like taking walks with kiddo before it gets too hot in the summer mornings. It’s usually not too busy traffic-wise and I can let her out of the stroller to just run ahead of me a little to burn off some energy herself. DIY Sandbox or dirtbox. Little fact: Kids love to dig and play in dirt. We plan on buying a cheap kiddy pool (less than $10) and filling it with either sand or dirt. We can hide a few toys within the sand/dirt and let them dig it out. I went to the local dollar store and purchased some little shovels and a toy dump truck for her to play with in said box. Beach days. Great idea of you’re close to one! Picnics. There’s something so fun about eating outside. You don’t even have to go anywhere, you’re own backyard will do. It’s the change in routine that will have them entertained. Treasure hunt. Take objects (ideally kids toys) and hide them outside having them find them based on description such as ”eye spy something that is red”. Garden. Kids love helping. Something like a garden is something they can help with (maybe something as simple as buying them a tiny watering can sort of thing). Have them help pick out flowers and I’m sure the first thing out of their mouths every morning will be ”flowers!”. They will love the added responsibility to help keeping it alive. Keeping little ones entertained can be exhausting for parents. It’s so easy to run out of ideas especially with very active toddlers. I hope there are a few new ideas for you and your little one. Bring on warm weather! 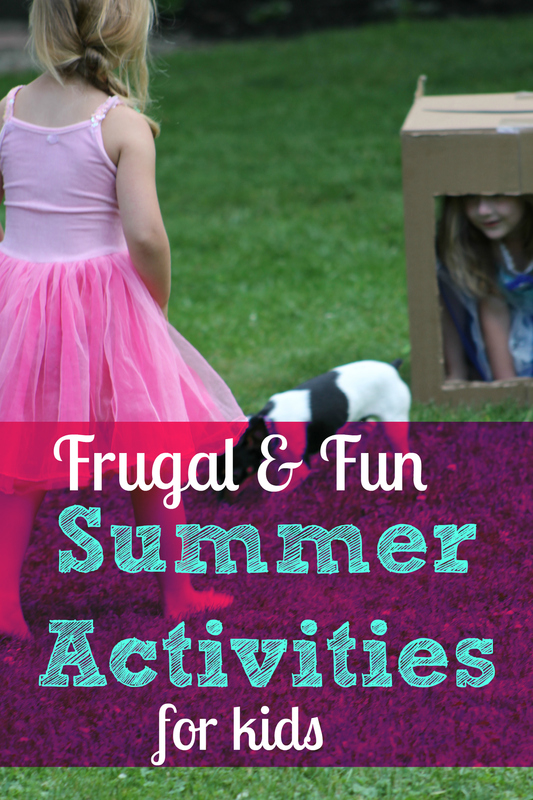 What other frugal summer fun ideas can you think of? Water! Slap some sunscreen on and break out the sprinkler! I’ve lived on my street for three years, with many young families and have never seen kids running through the sprinkler. Did this fad run out in the 1990s? If your kids are too young for sprinkler opt for a kiddie pool or water table. Our little one loves splashing water and throwing stuff in the water of her small stand-up water table. 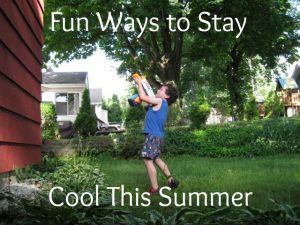 Cheap, easy entertainment while still enjoying the summer. If all else fails, check out a local community pool. Shade. Trust me, I know, some days even shade doesn’t cut it but plan a day that involves shaded activities only. Out of ideas? Built a fort outside with sheets to play in! You’re protected from sun yet burning off some energy while enjoying fresh air. Walk inside. If you need the AC try getting exercise at the same time. Super hot summer days are a get excuse to go to the mall…for a walk. Malls are air-conditioned and have great wide halls that make a great walking path. If a true shopping trip isn’t in the budget, go to the mall and maybe grab a small treat like an ice cream at the food court. As long as your child knows the stipulations for the trip to the mall, whining should be limited when they can’t get the t-shirt/teddy bear/cell phone that they neeeedddddd! Cool treats. Experiment with fun, cool healthy treats. Freeze smoothies into popsicles, eat some frozen fruit or jazz up water with frozen fruit for added flavor. 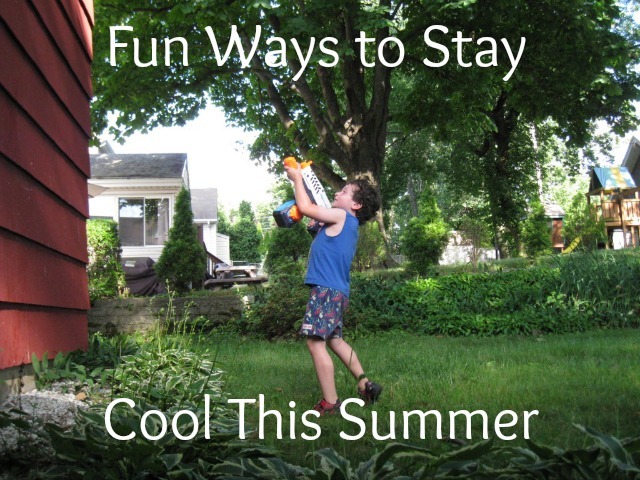 Hot summer days doesn’t mean all fun has to be zapped. 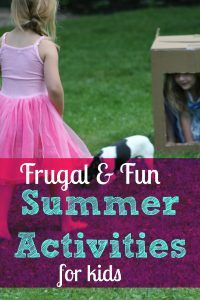 While it is more difficult, it isn’t impossible to find fun cool activities to do that won’t break the bank.